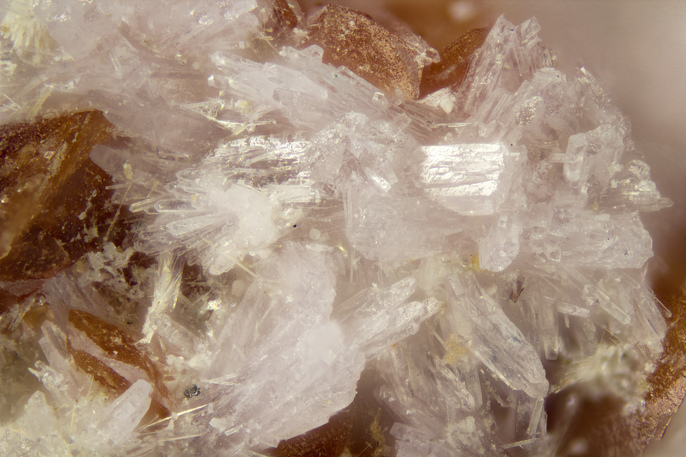 Calcioancylite-(Ce): Mineral information, data and localities. From the Greek αγκυλός ("ankylos") for "curved", in allusion to its usually rounded and distorted crystal shapes, and the prefix "CALCIO-" in allusion to its composition with CALCIum dominant over strontium, plus the "-(Ce)" suffix due to cerium being the dominant REE. The calcium analogue of Ancylite-(Ce). The cerium analogue of Calcioancylite-(Nd) and Unnamed (La-analogue of Calcioancylite-(Ce)). Note: The precise type locality is unknown - the mineral was found at an unspecified place in "Western Lands" (Western Russia or possibly Finland) in a glacial erratic boulder of unknown source; for details and discussion see Pekov (1998). Space group Pmcn (non-standard setting). Unnamed (Ce-analogue of Kozoite-(La) and -(Nd)) (Ce,La)(CO3)(OH) Orth. 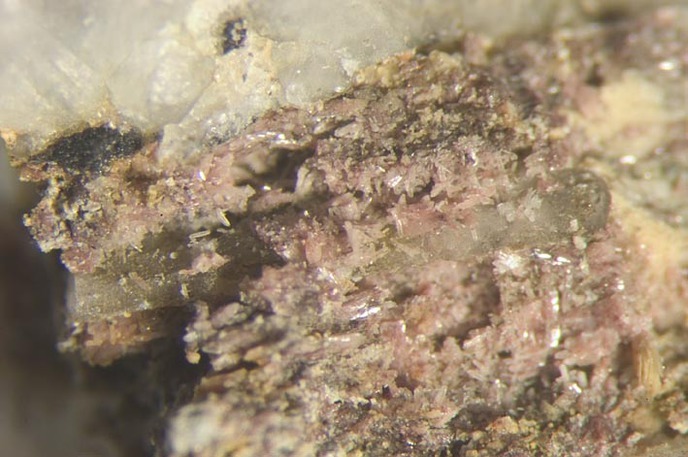 Unnamed (La-analogue of Calcioancylite-(Ce)) (La,Ce,Nd,Ca,Sr)CO3(OH,H2O) Orth. Microcline 5 photos of Calcioancylite-(Ce) associated with Microcline on mindat.org. Micheelsenite 3 photos of Calcioancylite-(Ce) associated with Micheelsenite on mindat.org. Rémondite 3 photos of Calcioancylite-(Ce) associated with Rémondite on mindat.org. Calcite 2 photos of Calcioancylite-(Ce) associated with Calcite on mindat.org. Aegirine 2 photos of Calcioancylite-(Ce) associated with Aegirine on mindat.org. Fluorapatite 1 photo of Calcioancylite-(Ce) associated with Fluorapatite on mindat.org. Titanite 1 photo of Calcioancylite-(Ce) associated with Titanite on mindat.org. Tuperssuatsiaite 1 photo of Calcioancylite-(Ce) associated with Tuperssuatsiaite on mindat.org. Cascandite 1 photo of Calcioancylite-(Ce) associated with Cascandite on mindat.org. Stilbite subgroup 1 photo of Calcioancylite-(Ce) associated with Stilbite subgroup on mindat.org. 5.DC.25 Peterbaylissite (Hg+2)1.5(CO3)(OH) · 2H2O Orth. 5.DC.30 Clearcreekite (Hg+2)1.5(CO3)(OH) · 2H2O Mon. 11.8.1 Calkinsite-(Ce) (Ce,La)2(CO3)3 · 4H2O Orth. 11.8.2 Lanthanite-(La) (La,Ce)2(CO3)3 · 8H2O Orth. 11.8.4 Lanthanite-(Nd) (Nd,La)2(CO3)3 · 8H2O Orth. 11.8.10 Kimuraite-(Y) Ca(Y,Nd)2(CO3)4 · 6H2O Orth. 11.8.11 Lokkaite-(Y) Ca(Y,Gd,Nd,Dy)4(CO3)7 · 9H2O Orth. Tschernik, G.P. (1904) Verh. min. Ges. St. Petersburg: 41: 43 (as Eisenkalkankylit, Mangankalkankylit). Chernik, G.P. (1904) The nature and chemical composition of a new cerian ancylite-like mineral. Zapiski Imperatorskogo Mineralogichsekogo Obshchestva, 71,43-54. Palache, C., Berman, H., and Frondel, C. (1951) The System of Mineralogy of James Dwight Dana and Edward Salisbury Dana, Yale University 1837-1892, Volume II: Halides, Nitrates, Borates, Carbonates, Sulfates, Phosphates, Arsenates, Tungstates, Molybdates, Etc. John Wiley and Sons, Inc., New York, 7th edition, revised and enlarged: 291-293. Mineralogical Record (1987) 18: 203. American Mineralogist (1987) 72: 1031 (Appendix 2). Pekov, I.V., Peterson, O.V., and Voloshin, A.V. 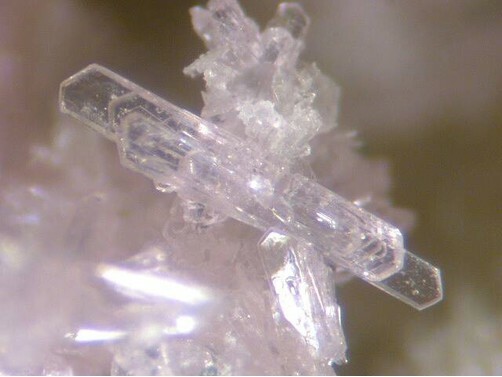 (1997) Calcio-ancylite-(Ce) from Ilimaussaq and Narssarssuk, Greenland, Kola peninsula and Polar Urals, Russia; ancylite-(Ce)-calcio-ancylite-(Ce) an isomorphous series. Neues Jahrbuch for Mineralogie, Abhandlungen, 171, 309-322. Pekov, I.V. (1998) Minerals first discovered on the territory of the former Soviet Union. Ocean Pictures Ltd., Moscow, 369 pp. Larsen, A.O. and Gault, RA. (2002) Calcio-ancylite-(Ce) from syenite pegmatite at Tvedalen, Oslo Region, Norway. Neues Jahrbuch fur Mineralogie, Monatshefte, 411-423. Belovitskaya, Y.V., Pekov, I.V., Gobechiya, E.R., and Kabalov, Y.K. (2013) Refinement of the Crystal Structure of Calcioancylite-(Ce) by the Rietveld Method. Crystallography Reports (2013): 56(2),216-219. English translation of original publication in Kristallografiya (2013):58(2),197-200.
ⓘ Kipawa alkaline complex ? Horváth, L. and Gault, R.A. (1990) The mineralogy of Mont Saint-Hilaire Quebec. Mineralogical Record: 21: 284-359.; Jambor, J.L. and Roberts, A.C. (2001) New mineral names. American Mineralogist: 86: 197-200.; Belovitskaya, Y.V., Pekov, I.V., Gobechiya, E.R., and Kabalov, Y.K. (2013) Refinement of the crystal structure of calcioancylite-(Ce) by the Rietveld method. Crystallography Reports: 58(2): 216-219. Piccoli, G.C., Maletto, G., Bosio, P., Lombardo, B. (2007): Minerali del Piemonte e della Valle d'Aosta. Associazione Amici del Museo "F. Eusebio" di Alba, Ed., Alba, 607 pp. - Gamboni, A., Gamboni, T., Pileri, P. (1997): Su alcuni minerali del massiccio granitico del monte Limbara zona "Furru e Conca", comune di Calangianus. Rivista Mineralogica Italiana, 2/1997, 123-134. Gamboni, A. & Bonacina, E. (2006): Massiccio granitico del Monte Limbara: calcioancylite-(Ce) e kainosite-(Y) di Furru e Conca, Calangianus, Olbia-Tempio Pausania, Sardegna nord-orientale. Micro (località), 1/2006, 137-140. Identification with UK Id. Service of AMI. Uwe Kolitsch and Hans Vidar Ellingsen (SXRD + SEM-EDS); Uwe Kolitsch & Joachim Gröbner (SXRD + SEM-EDS); Kolitsch, U., Blaß, G., Jahn, S., Cámara, F., von Bezing, L., Wartha, R. R., Tremmel, G., Sturla, M., Cerea, P., Skebo, M. and Ciriotti, M. E. (2016): Aris - mineralogy of the famous alkaline phonolite. AMI - Associazione Micromineralogica Italiana, Cremona, Italy, 95 pp. Murzin, V. V., Chudnenko, K. V., Palyanova, G. A., Varlamov, D. A., Naumov, E. A., & Pirajno, F. (2018). Physicochemical model for the genesis of Cu-Ag-Au-Hg solid solutions and intermetallics in the rodingites of the Zolotaya Gora gold deposit (Urals, Russia). Ore Geology Reviews, 93, 81-97. Belovitskaya, Y. V., Pekov, I. V., Gobechiya, E. R., & Kabalov, Y. K. (2013). Refinement of the crystal structure of calcioancylite-(Ce) by the Rietveld method. Crystallography Reports, 58(2), 216-219. Palache, C., Berman, H., & Frondel, C. (1951), The System of Mineralogy of James Dwight Dana and Edward Salisbury Dana, Yale University 1837-1892, Volume II: 292. Savel’eva, V.B., and Karmanov, N.S. (2008): Geology of Ore Deposits 50(8), 681-696. Hinterlechner-Ravnik, A., Medenbach, O. & Niedermayr, G. (1995): Calcio-Ankylit-(Ce) aus einem Tonalitsteinbruch bei Cezlak, WSW Slovenska Bistrica, in Slowenien. Mineralien-Welt, 6 (2), 15-18; Postl, W., Bojar, H.-P. & Žorž, Z. (2015): Calcioankylit-(Ce) und Sepiolith aus dem "Tonalit"-Steinbruch in Cezlak bei Oplotnica, Pohorje-Gebirge, Slowenien. Der Steirische Mineralog 30, 42. Hubbard, N., Green, D.I., and Tindle, A.G. (2008) Barium Zeolites and Calcioancylite-(Ce) From Guisachan Quarry, Tomich, Highland, Scotland. Journal of the Russell Society, vol. 11, 73-79. Mineralogical Record (1987): 18: 203-205.